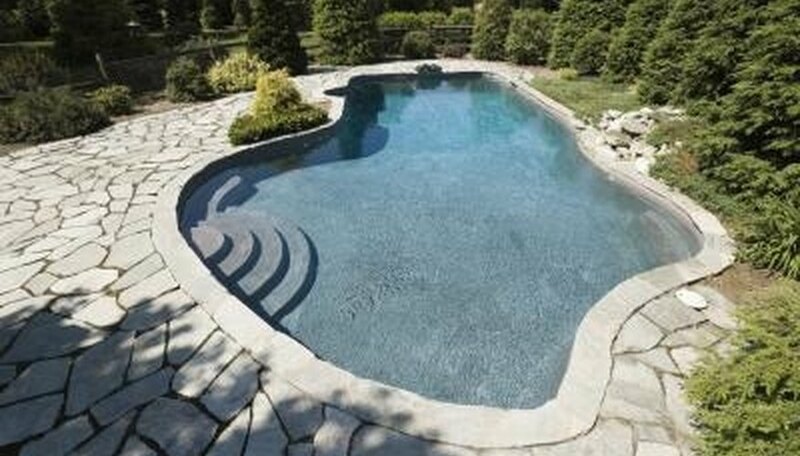 Home swimming pools offer relief from the heat, an opportunity for exercise, and hours of outdoor enjoyment. They also require regular testing for safe chemical concentrations. Easy-to-use home swimming pool test strips with color comparison charts are available at home improvement and pool supply retailers. Use them to read your water's pH. Then take the necessary steps to adjust your pool water to the alkaline level desirable for swimming pools. Dry your hands well with a towel. Handling the test strip with wet fingers will alter the test results. Read the test strip instructions to determine how long the strip should remain underwater. Open the test strip container. Remove a strip, grasping its top edge between your thumb and index finger to minimize contact. Replace the container's cap. Submerge the test strip directly into the swimming pool, to the depth recommended in the instructions. Keep it underwater for the recommended length of time, usually a few seconds. Remove the strip from the pool. Shake off the excess water. Place the strip on a dry table or other flat surface. Wait for the manufacturer's recommended time while the strip changes color. Use your watch to time the wait. Compare the strip's color with the test color chart. The chart may be on the back of the container. A color falling in the 7.2 to 7.8 pH range is suitable for pool water. A lower number is overly acidic -- a higher number is too alkaline. Get more accurate readings of your swimming pool water's condition by using 5-in-1 test strips to measure chlorine, bromine, total alkalinity and water hardness as well as pH. Discard any pH test strips past their expiration date. Michigan State University: Pool Water Testing: William De Haan, et al.